A recessed light or downlight is a metal light fixture that is installed above the ceiling line. The light is fixed into a hollow opening in the ceiling, which gives an appearance of light shining out from a hole. The lighting aims in the downward direction similar to a broad floodlight or spotlight. Recessed lighting requires extensive ceiling wires. This lighting system comes with a light-to-light connection where all the lights are connected in series through a single cable. The visible portion of the recessed light forms the trim. 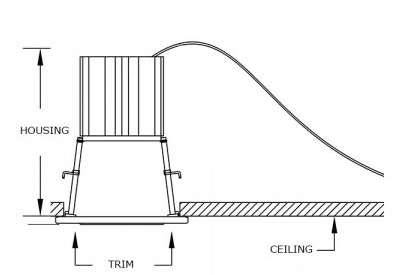 Trim is viewed when looked up at the fixture. The trim has a thin lining around the edge. The fixture unit itself forms the housing that is inserted into the ceiling during installation. The housing unit consists of a lamp holder. The last part is the bulb, which is inserted into the recessed lighting fixtures. Based on the amount of light generation required, a variety of bulbs is available to choose from the market. The use of recessed lights promotes minimalism in a room. The recessed lights illuminate the room without any clutter as usually happens in the case of ceiling lights. These lights are the best choice for low ceilings as they do not protrude from the ceiling. Traditional hanging lights make a room appear constrained. A low-roof room can always use recessed lights over traditional lights. 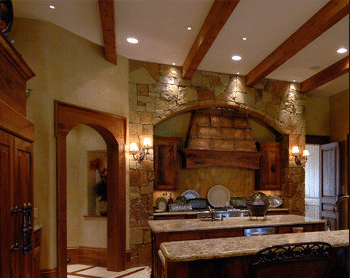 Recessed lights guarantee clutter-free lighting and good illumination. When and Where to Use Recessed Lighting? Recessed lights are used as ambient lighting when it is necessary to brighten up a fully traffic room or space. In spaces where there is a focal point, say a piece of art or fireplace, special focus can be directed towards them with the use of spotlighting which is achieved by the use of recessed lights. Recessed lights can be provided in walls as they bounce the light into space beautifully compared to direct lighting. This gives an appearance of wall washing. Recessed lights shrink to the given space with no fixtures visible, which is a strong advantage when the interior is a great concern. They are the best choice for a room with low ceiling height like basements. 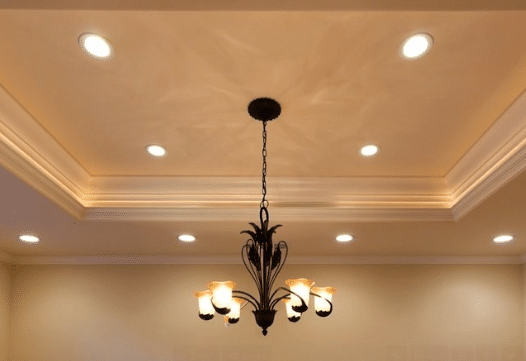 Properly arranged recessed lights can have a complete room coverage compared to ceiling lights whose coverage decreases at the room perimeter. Recessed light units can be designed waterproof for wet locations. Recessed lights follow a perennial style that won’t go out of style. Recessed lights cover a circular area. It shines only the ground below and won’t extend far. As a recessed light covers a small area, too many lights must be installed to cover a room. Gaps between the wallboards and the light can cause air leakage.